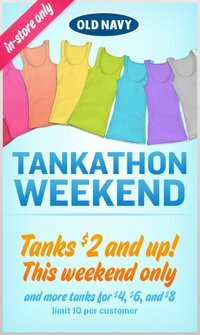 Mark your calendars for this weekend’s Old Navy Tankathon Weekend! Tanks for the whole family will be $2 and up IN STORE ONLY. For those of you that got in on the Old Navy Groupon deal, here’s another great way to spend it! Sale is on Saturday and Sunday, June 25th and 26th ONLY. Select stores open at 7am; be sure to check with your nearest location for store hours. ***Update Become a facebook fan of Old Navy then print this coupon HERE to take advantage of a Friday presale on the tanks!